We know I have many. You would think that my projects were perfect for as many things as I complain about. :) But another thing that I feel detracts from your smocking is pleating thread pleats left in the garment. There is a difference between handmade and homemade. Or euphemistically called "loving hands at home." 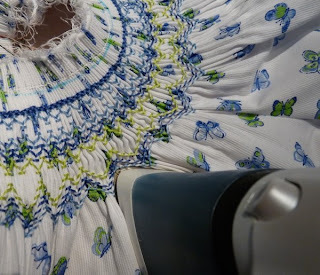 One thing that screams homemade in my oh not near humble enough opinion is when you remove the pleating threads from your garment and don't press out the extra pleats that remain below your smocking. Some people are afraid of hurting the smocking by getting the iron up to that stitching. Not so. I scoot my hot iron right up to that stitching. And will either spritz it with starch or water. Okay I admit, I use starch usually and get it pretty wet. I want those pleats GONE! I do this before I construct it so I can especially get into those pleats over the sleeves. Look at the difference in the two sleeves. The sleeve on the left has not been ironed up to the smocking. See how it makes the sleeve lay flat? You won't get that precious puff sleeve if it has to fight the pleating in the fabric. The sleeve on the right hasn't even had the cuff.band applied and you can see it already is taking on that puff shape. So don't be afraid, use your iron. t tip. Beautiful Little dress! That was supposed to say "great tip"
I think of you every time I iron.... :) I will admit to failing to press sleeves right on bishops but will not do that anymore. 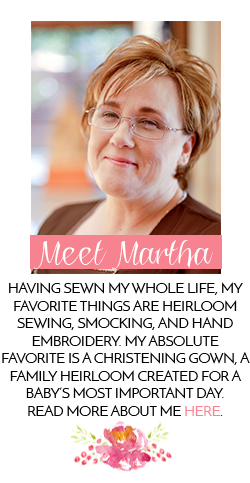 Martha, thanks for the good advice. It's something I, as a novice smocker, wasn't aware of. One of my peeves, too! It just puffs up so prettily when ironed, particularly if there are some "lots of steps" trellises in the bottom row.